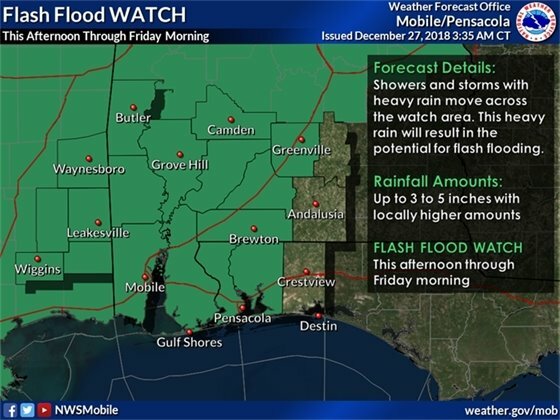 The National Weather Service has issued a flash flood watch for the Pensacola area from noon today until Friday morning. We could locally see 3”-5” of rainfall possible in the next 24 hours and higher in some isolated areas. Our area is also listed as a marginal risk for damaging winds and a brief tornado. City officials are aware of the weather forecast and we are taking necessary precautions. Due to the weather, the airlines serving the Pensacola International Airport are experiencing some delays or cancellations for Dallas and Houston flights. Passengers should be certain to check with their individual airlines for impacts on specific flights. We are also reminding residents to be mindful of any impending weather forecasts. Public Works and Facilities crews will continue to be out prior to any weather events as part of normal precautionary operations. We will continue to monitor and provide updates as they become available.If you see a storm drain that appears to be obstructed, please remove the obstruction. We have known problem areas (hot-spots) that a couple of the stormwater crews keep close tabs on so that if a problem does start to develop they are ready and on top of it. Then, we have other crews on standby ready to quickly address any notifications we get for problems out in the community. As an additional reminder be sure to also report non-emergency related issues to Pensacola 311. Below is a list of additional resources that can keep you up to date and connected to health and safety services. Additional Information from the National Weather Service.